On the occasion of visit of Most Rev. Ralf Meister, Bishop of the Evangelical Lutheran Church of Hanover with his delegation to India, the Ambassador of the Federal Republic of Germany in India Dr. Martin Ney hosted breakfast on 28th January, 2016 at his residence. Apostolic Nunciature of the Holy See to India Salvatore Pennacchio also joined for breakfast along with few Indian Church leaders. The Bishop Ralf Meister, delegation and Rev. 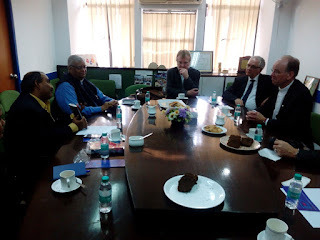 Markus Lesinski, Pastor for the German speaking protestant Congregation of India, Nepal and Bangladesh visited NCCI Delhi office on 28th January, 2016 . Bishop Collin Theodore, Secretary, NWICC , Rev. Sailakant Bagh, Treasurer, NWICC and Mr. Samuel Jayakumar, NCCI Executive secretary had discussion with them on various concerns of Christians in India.